Tues. Feb. 12, 2019 6 p.m.
You may have graduated in the ’90s, but your teen years were totally ’80s. 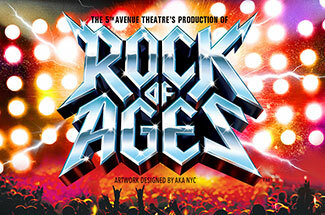 Join your classmates at The 5th Avenue Theatre production of “Rock of Ages,” the hit Broadway musical packed with the songs of your youth, including Guns N’ Roses, Poison, Bon Jovi, Pat Benatar and more. The 5th Avenue Theatre’s production features Diana Huey (Ariel in The 5th Avenue’s 2017 production of “Disney’s The Little Mermaid”), Galen Disston (lead singer of Seattle indie-rock favorite Pickwick) and Mickey Thomas, lead singer of 80s ballad powerhouse band Starship. The 5th Avenue Theatre is offering discounts on a limited number of tickets for the Feb. 12 show. Save 25% and have your ticket fees waived on all seats. Click the button or go to 5thavenue.org and enter the promo code: 1994REUNION. Before the show, the UW Alumni Association invites you to drop by for a complimentary Class of 1994 cocktail party, catered by Palomino and hosted in the pc2 room. Cocktail party | 6–7:15 p.m.
“Rock of Ages” | 7:30 p.m.